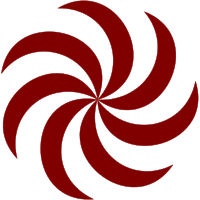 Borjgali (Georgian: ბორჯღალი; also Borjgala or Borjgalo) is a Georgian symbol of the Sun with seven rotating wings over the Christian Tree of Life and is related to the Mesopotamian symbols of eternity. It is also related to the Triskelion, another rotational symbol of eternity. It is usually depicted within the circle that symbolizes the Universe. The roots of the Tree go into the "past" and its palm-like branches are for the "future". The Tree itself symbolizes the continuity between past, present and the future. The Borjgali is usually placed above the tree and symbolizes the Sun, eternal movement and life. The term Borjgali is believed to derive from Megrelian word ბარჩხალი ("barchkhali"), which literally means "strong shining". Some other scholars believe that it has different origins. In old Megrelian borj means "time" and gal means "pass" or "flow". So the whole phrase would mean "the flow of time". Nowadays, the symbol is used in Georgian IDs and passports, as well as on currency and by the Georgian Rugby Union. Georgian rugby team players are called ბორჯღალოსნები (borjgalosnebi), which means "Men bearing Borjgali".